This is something First Tunnels always bang on about at this time of year but don’t underestimate how warm it can get inside your polytunnel. You will be amazed by how warm your polytunnel can become as soon as the sun shines, even in very early spring. Keeping your polytunnel at a reasonable temperature is not only important for you, as the gardener, it will also help make sure that your plants remain healthy. What is more, keeping your polytunnel at the right temperature will also help to ensure perfect polytunnel pollination. Keep this in mind as the first pollinators begin to arrive. Make sure your provision for ventilation is all in good working order and that you let plenty of air circulate around those tender new crops and plants. Keep them well-watered too. Remember, plants usually need a good soaking before planting out. Creating bee and bug hotels to provide habitats where these creatures can take up residence near your polytunnel. Providing water for bees and other pollinators. Bees also need water to drink and to evaporate to cool off, but can drown when trying to drink from water bowls. A small bowl filled with pebbles to the surface will help them drink safely. Alternatively, a garden pond with pebbles or shingle on a very gently sloping bank at one side will enable bees to get their water without danger. It’s easy to create your own natural pollination with the Polytunnel environment with the introduction of marigolds and other useful companion plants. Marigolds add colour to your polytunnel, but they’re not just pretty faces, they will help pollinate your crops too, by attracting a wide variety of pollinators. Other great plants for perfect polytunnel pollination include yarrow, borage and lavender, all of which will not only attract the bees but will also have other benefits too. Bees can see purple and white more clearly than other colours and so will be particularly drawn to flowers of these colours. When choosing flowers for in and around your polytunnel, try to choose options that provide pollen and nectar throughout the year. It can be a good idea to consider planting around your polytunnel as well as just the planting inside it. If you have lawn areas, try not to mow these too frequently. Allow weeds/ wild flowers/ clovers to grow amongst the grasses. Consider planting more trees around about too. Five blossoming trees in a woodland garden could provide the same amount of pollen and nectar as an acre of meadow! Perfect Polytunnel Pollination and Pest Control? Perfect polytunnel pollination is one thing insects can help us achieve. 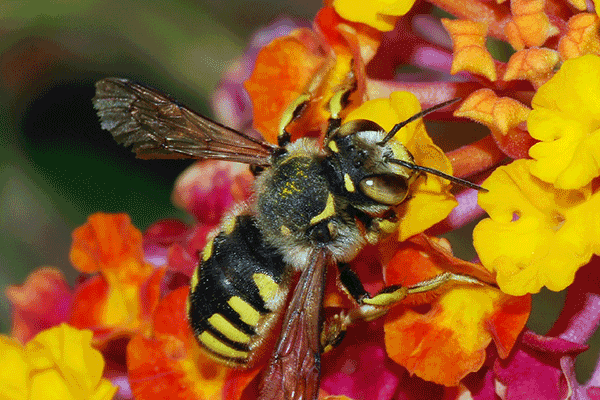 But attracting beneficial pollinators can also help us with pest control. Ladybirds are one predatory insect that you most definitely want to encourage in your polytunnel. Not only are they great pollinators, they also eat aphids, helping to keep the pest populations down. Good ventilation, again, it an important element in making sure that ladybirds and other similar creatures want to make a home in your polytunnel. These plants will also attract other pollinators, many of which will also help with pest control in your polytunnel.